Just as in the previous post Megan McArdle is generally right but makes an error, the same can be said about this post from Ezra Klein on health care. Ezra looked at a Kaiser/NPR poll on health care and does make some good points, such as questioning why people have such little interest in “in implementing the findings that emerge from cost effectiveness studies.” In this case it is more common for physicians than for the general public to be encouraged by cost effectiveness studies as we realize how much is done without good evidence. We want the data to make the best choices for our patients. Honestly, I’m surprised patients even have an opinion on that. And it might be a very weak opinion. 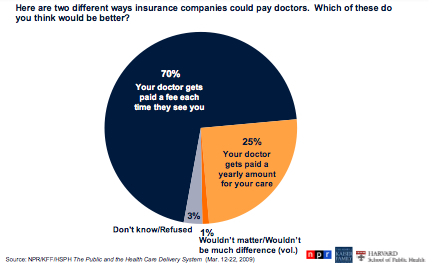 But for now, the public prefers that doctors get paid for each thing they do than on a salary basis. They prefer, in other words, that doctors have an incentive to do more rather than do less. Here the majority of Americans are smarter than Ezra. Many have experienced the horrors of the HMO era in which doctors were actually paid based upon how little care they provided. Many also see the difference between the more old fashioned model of doctors in private practice as opposed to the increasing number of doctors who are employees paid a salary. They have seen the difference between a doctor who is motivated to work long hours to care for their patients and salaried doctors who check out at 5:00. Imagine the negative incentives for being paid a yearly amount regardless of what is done. I’m often at the office past 8 p.m. to see people who call with problems late in the day. If paid a fixed salary most doctors would tell them to take an aspirin and call (or preferably don’t call) back next month. I’ll often wind up spending a half hour to an hour with a patient who is having serious problems. If paid a salary doctors are encouraged to see the highest number of patients possible in as short a time as possible. The medical offices run by the local hospital (which has bought up most of the doctors in town) has nurses with stop watches monitoring office calls and knocking on the door to end the visit if it lasts over fifteen minutes! Sure, when paid fee for service for taking care of patients this could lead to incentives to do too much to make more money. This is reduced by both utilization controls and by the fact that there is so much more to do than we have time for. Of course, as in the previous post, I’m writing from the perspective of primary care. There is undoubtedly far more waste in some of the high-priced procedures as opposed to primary care offices, but this is also the situation which most people are probably considering when responding to poll questions such as this. It’s more reasonable to note that reimbursement structures are creating an undersupply of primary care physicians, compared to the number of specialists. We reimburse for procedures, not wellness, so surgeons are well paid and GPs aren’t. This has led to the bizarre fact that Medicare chronically underreimburses (and thus insures an undersupply of) geriatricians, which should be the one doctor a program like Medicare produces a lot of. As she also notes, this is nothing new. There have been recommendations for years to increase reimbursement for primary care as opposed to subspeciality care. Medicare has made small moves in that direction, but typically the specialists put up enough of a fight to preserve higher pay for their procedures. Pay for office visits, and you will get a lot of unnecessary office visits. The point is that we don’t have enough primary care people to handle all the office visits which would be needed if we expand health care coverage. If the capacity of primary care physicians to conduct office calls is already exceeded at current payment levels, paying more is not going to necessarily lead to unnecessary office visits. There is little need to preform unnecessary office visits when there is a demand for more necessary office visits than can be filled. What increasing pay for office visits will do is to get more physicians to be willing to make their income from primary care office visits as opposed to from procedures.